Looking for the best 2018 Black Friday & Cyber Monday Canon EOS Rebel T7i deals, sales, rebates and specials? Here is the buying guide for you! Packing a versatile feature-set in a sleek and portable body, the Canon EOS Rebel T7i (also known as Canon EOS 800D) is arguably the best ever Rebel and it offers advanced imaging capabilities along with a convenient range of controls and connectivity. Fast and accurate Dual Pixel CMOS AF with phase-detection locks focus quickly and accurately to help make sure you don’t miss a great shot. In addition, the Canon EOS Rebel T7i/800D DSLR camera achieved an excellent 80% overall score and Gold Award from the experts at DPReview, and it is suggested for “casual and beginner photographers looking for an easy-to-use and relatively easy-to-learn DSLR“. So, if you are interested, just get it this holiday shopping season! $50 off on Canon EOS Rebel T7i Body: $699 at Amazon, B&H, Adorama. $150 off on Canon T7i with 18-55mm Lens: $749 at Amazon, B&H, Adorama. $200 off on Canon T7i with 18-55mm Lens Video Creator Kit: $799 at Amazon, B&H, Adorama. 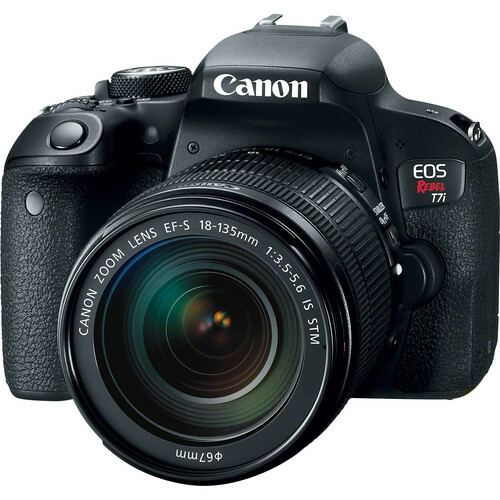 $350 off on Canon T7i with 18-135mm Lens: $949 at Amazon, B&H, Adorama. $100 off + $350 MIR on Canon T7i with Printer Bundle: $758 at B&H. $350 off + $350 MIR on Canon T7i with 18-135mm Lens and Printer Bundle: $1,0518 at B&H.